The Chandlery was originally built on the Witley Court Estate (Foley era), the earliest parts back to around 1730. It was a shop from its earliest days, being registered as a chandlery. Now The Chandlery is a most comfortably appointed family home and guest house, with room enough to provide superb bed and breakfast accommodation. The house features a wealth of waxed wood, and a variety of attractive and colourful wall finishes. Our guest rooms consist of Flamingo--family room with queensize brass bedstead plus a single with its own private bathroom and foyer, Canary, a double room and Woodpecker, a twin/triple room, both rooms en-suite with shower. Breakfast is taken in our elegant dining room, furnished in the Cape Dutch style from South Africa. A large TV lounge allows plenty of space for relaxation, a break for refreshments or catching up on the latest books (all bedrooms also have TV's). Our rates include full English or a 'health' break-fast of yoghurt, fruit and juices, cereals and home-made country fruit conserves. We bake our own delicious bread, too! 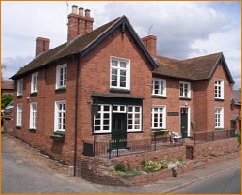 This is a family home and children of any age are most welcome to stay with us. Baby sitting is by prior arrangement. There is ample, safe parking for cars and plenty of choice for lunches and evening meals. No Smoking--We operate a "no-smoking" policy throughout the house. Packed Lunches--in addition to or in lieu of your breakfast. Let us know the evening before. Rooms Access--by 4pm, vacate rooms by 10am if you are moving on. We are flexible in this, but you will understand we need to change linen etc so early room access is best for us. Stay with us for country walking, top class barbel fishing on the River Teme, the River Severn and the Avon. We offer real, friendly personal service and a relaxed ambience. We often accommodate wedding guests or other partygoers who appreciate being able to arrive early, changing then going off to festivities. Our rates are £27.50 per person per night sharing. Please call to discuss rates, for example when 3 share a room or children are in the party, where we offer significant discounts. Accommodation is subject to availability and the payment of a reservation deposit, amount to be advised, usually £20.00.